If you want to spend time in the wilderness, you should be ready put some effort into protecting it – by choosing the right gear. Each product in the new Skarvan Trekking Series bears the VAUDE Green Shape label so you can be sure it’s an eco-friendly, functional product made from sustainable materials. Like all VAUDE apparel of the S18 collection, the Skarvan Jacket features Eco Finish, an eco-friendly water repellent that is 100 % PFC-free. The Skarvan Jacket in a waterproof hybrid construction offers weather protection for lightweight trekking! 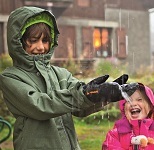 The rain jacket features a longer cut and a technical polyamide shell that’s not only robust, but also absolutely waterproof and windproof with a 100% PTFE-free Ceplex membrane. It is designed for carrying heavier trekking backpacks: a robust 3-layer material was used at the shoulders and the hips while a very lightweight 2.5 layer material was used at low-stress zones. The pockets are set higher so that you access your necessities even when wearing a hipbelt, while long vents and a breathable membrane ensure a comfortable microclimate. In addition, VAUDE has signed on to the Greenpeace Detox Commitment and has fully eliminated the use of harmful PFCs (perfluorinated compounds) that are often still used in laminates and waterproofing finishes for outdoor clothing. 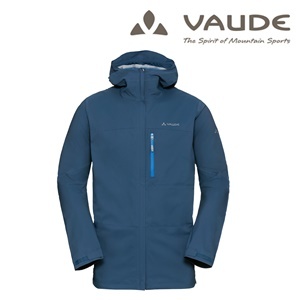 In the interest environmental conservation, VAUDE is using Eco Finish exclusively for the Summer Collection 2018 – a water repellent finish that’s 100% fluorocarbon-free, proving that technical, high performance products can be eco-friendly and still look good!